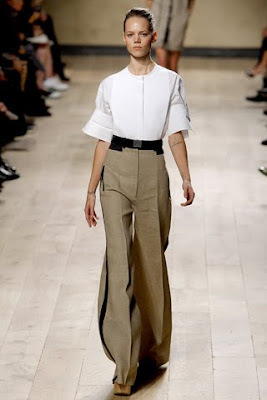 It was quite a comeback for Phoebe Philo when she sent Celine's Spring 2010 collection down the runway last October 2009. Now that Spring is in the air, let's revisit! I can't wait to see the retail version of these in the stores! Incidentally, her interview with T Magazine was a great read! While she never confirmed it, it's sad if the rumors are true, that she and Central Saint Martins buddy Stella McCartney have gone their separate ways figuratively, if you get what I mean. Great pick Angela! I love that look too! Love the top and sandals especially!